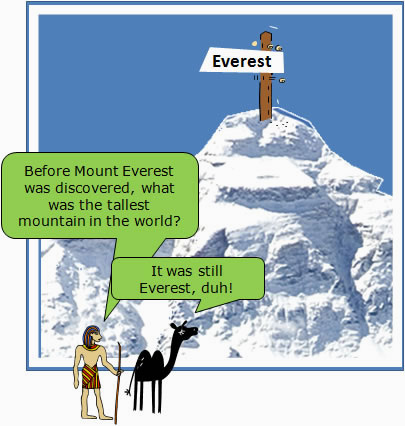 If I asked you, “what is the tallest mountain in the world?” you’d probably say Everest… But are you sure? Have you personally measured the heights of all the mountains in the world? Science is amazingly useful. We use science to test how long food lasts in and out of the fridge, we use it to discover how good the brakes are on cars and we use it to test the safety of medicines. But that’s just the start of it. Science is involved in just about every aspect of life, these days! Scientists have even measured the height of Everest! First they put a radar transmitter on the top. 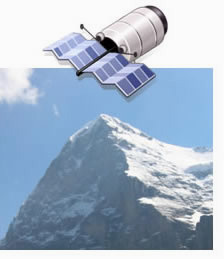 Then with the help of an overhead satellite, they measured the height as 8850 metres. Science is the best method we have to check out what’s true. It’s so reliable because … it relies on gathering observations to support or throw out ideas. In science, when we talk about ‘Observations’ this refers not only to what we can see, but to anything we can detect using our senses. Observations are used in science to test out simple things – like the height of Everest. They’re also used to test more complicated theories … like how the Universe began. More on that in a moment but first here’s a chance to try it for yourself – Can you work out what is inside a sealed box, without opening it? Were you able to work out what was in the box from the sounds? The ideas you suggested were not based on pure guesswork, were they? They were based on the evidence (or observations) available to you. On the next page, we see how scientific methods have been used by scientists to try to find out where life, the Universe and Everything came from.